Jeb Bush and Bill Belichick at Andover: The presidential candidate and Patriots’ head coach were classmates during Phillips Academy’s counterculture moment. The young Jeb wasn’t always straitlaced. There were his Andover years, when he and classmates (like the future Patriots head coach) cut loose. Young Bill Belicheck, left, and Jeb Bush. There were some chuckles when New England Patriots head coach Bill Belichick showed up at his press conference this past weekend to discuss Deflategate, aka Ballghazi, wearing a button-down collared shirt instead of his usual hoodie—a veritably preppy look for the surly football gnome. But really, no one should have been surprised, because Belichick in fact has deep preppy roots. How deep? He was at Phillips Academy in Andover, Massachusetts, at the same time as John Ellis Bush, scion of America’s preppiest leading family. And what a time it was. Now that John Ellis (you may know him better as Jeb) is all but officially running for president and Belichick is seeking to win his fourth Super Bowl amid one of the most delightful sports scandals of all time, it’s worth revisiting the moment when the two men both walked the rarefied campus in northeastern Massachusetts, not just for the coincidence of their overlap there, but because it represented a quite remarkable locus of American cultural transformation. Jeb arrived at Andover in 1967 as a distinctly reluctant freshman. He had, earlier that year, been granted permission to stay in Houston with family friends to finish his eighth-grade year rather than accompany his family to Washington, where his father had just been elected to Congress. But that fall, he was shipped off to Andover, just as his father and older brother, George, had been before him. George’s struggles to conform to family expectations are by now the stuff of national lore, but Jeb was also not keen on following the straight and narrow path laid out for him. He “was experimenting and trying to figure out his role,” his cousin John Ellis told Peter and Rochelle Schweizer for their 2004 book, The Bushes. 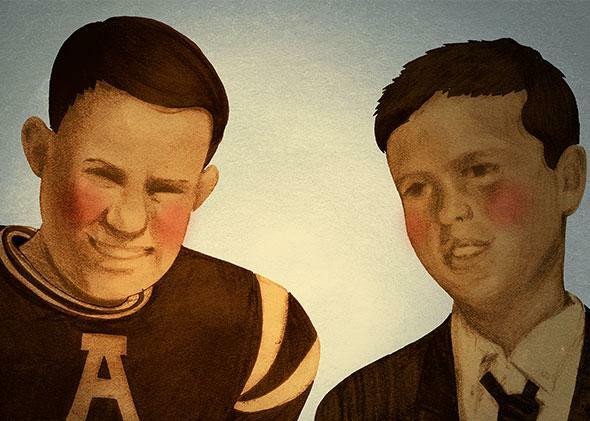 At first glance, Andover would have seemed an oppressive environment for a teenager grappling with living up to his paternal example: Photographs of his father, a baseball standout in his time at Andover (and later a World War II hero), lined the school’s walls. Jeb rebelled against that aura, albeit in quieter ways than his more extroverted older brother had done: Jeb was more likely to get high than go carousing, he grew his hair long, and he joined the Socialist Club. Yet as time went on, these small acts of insurrection were not so much breaking with the Andover mold as adapting to it. Jeb had arrived on the campus in the midst of a period of astonishing flux: Andover itself was experiencing its own countercultural coming-of-age moment as the upheaval underway on not-so-distant university campuses rippled outward. Where the prep schoolers’ natural aspiration to be like their elder collegiate siblings had once meant mimicking their sports jackets and nicknames, it now meant copying their protest pose—a shift that the younger Andover faculty only encouraged. “It was like a college campus in so many ways—there was very little supervision, and many of the faculty were themselves fully into the ’60s,” George Church, a Harvard geneticist who was one class behind Jeb, tells me. “We were all much more grown up than we should have been, trying to be like our revolutionary colleagues at colleges.” In this context, he said, Jeb’s sampling of mind-altering substances—touched on recently by Vanity Fair—was par for the course. “There were a lot of experiences to be had in the ’60s in this high school that was like a college, and Jeb availed himself of them, as we all did,” Church says. There to witness this transformation, along with Jeb, were his fellow members of the Class of ’71, a group that also included Lincoln Chafee, who would eventually assume his father’s seat in the U.S. Senate, and Tom Foley, who would to go on to become a successful venture capitalist and George W. Bush’s ambassador to Ireland before twice losing bids to become Connecticut’s governor, in 2010 and 2014. (Just one and two years behind them, respectively, were authors Buzz Bissinger and Michael Beschloss.) And at the start of their senior year, they were joined by Belichick, who had come north for a postgraduate year after attending high school in Annapolis, where his father was working as a talent scout for the Naval Academy’s football team, to improve his odds of getting into a premier college. Jeb lived with a local family and taught English. (Some accounts have him helping out with school-building as well.) More crucially, he fell in love with a local girl named Columba, a pretty, petite, devoutly Catholic 16-year-old who had been raised by her grandfather after her father abandoned her mother when she was young. Jeb decided to attend the University of Texas instead of Yale, the usual destination for Bush men, which allowed him to be closer to her, and proposed to her at a Mexico City restaurant before he’d even graduated—and before he’d introduced her to his parents. But his countercultural rebellion lasted only so long: After graduating, he got a job with Texas Commerce Bank, which had been founded by the family of his father’s political ally (and future Secretary of State) James A. Baker III. And with that, Jeb was off to the races, as I describe in last week’s New Yorker. Have Belichick and Bush kept up at Class of ’71 get-togethers? Doubtful. Bush is less than fond of his Andover years—“I was a cynical little turd in a cynical school,” he told the Miami Herald in 1986. So the reunion may have to wait. Perhaps until the White House in 2017, when America’s third President Bush welcomes Belichick and the Patriots for their umpteenth trophy celebration? Presumably, Belichick would for that occasion revert to the Andover dress code—the pre-1969 one, that is.